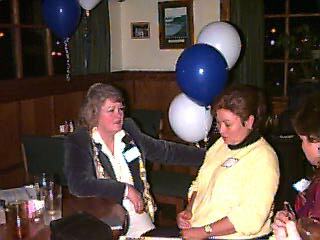 Linda Key '65, Janice Char '64, and Bev Char '66. First let me tell ya'll I HAD THE BEST TIME!!!!!!!!!! I walked into Silky's and was greeted by two men I didn't know and I don't really remember right now, but if I see pictures I could tell ya. I told them I had just driven 7 hours and Mr John Prunier made that announcement. I really was exhausted from that drive, but as soon I seen Harold!!! Oh boy - let the fun begin!!!! I really couldn't wait to see Harold Forster, because we were friends back there and well we had the best time talking about old times. I think it's a great idea to have an annual get together there in Southern California. I have a new car now!!!! Yeah for nice ex-spouses!!!! I finally met the wonderful John Prunier!!!! What a wonderful man!! I had to hug him twice!!! Did I tell ya'll he was wonderful? He was telling me what it takes to put pictures up on the site and let me tell ya'll folks - this man is great - he puts so much into this for us and I do so appreciate it and I know all ya'll do too!!! :) Thanks John for all you do!!! I met Wendy '79 and Sue Ann Banks '80 and it was so great to see them. Like Dary said, Wendy had us really laughing!!! Wendy and I knew alot of the same people back at CAB. We were going through the yearbooks page by page and what fun that was. The only yearbook I have is the '80, and I was there from '75-'80 so seeing these yearbooks was something I really had to do. Sue, it was great to see you again. I can't believe you've been living there in San Berdo all this time!!! Now I have one more reason to drive on over!!! Since I have a newer CAR!!! :) We can do lunch!!! I noticed this beautiful person sitting at the table and I introduced myself. I finally met Bev Char 66! Since she just joined the WHOA recently, I knew what she was feeling - all this excitement! Just overwhelming. She told me that story about that guy who was holding hands with her and her sister under the table! It was great to hear her tell it in person! I know Bev had a great time!! Bev, it was so nice to meet you!! And yes, I hope we can get together again - hopefully in SC or NC? I didn't get to talk to your sister, but I am sure she is as wonderful as you!!! I want to hear more stories from you!!! I got to see Lindsey Woods '79 again. I didn't even recognize him!!! He showed me his pic in the yearbook and WOW! It came back to me, I only remember him the way he was then. He reminded me of how one of my best friends really liked him and he just broke her heart. He really brought back some memories for me, because I remembered how that friend told me how she like him so much. Thanks for that Lindsey. I was great to meet your wife. My how you have changed! But you are still beautiful like you were back in highschool!!!! Another one I got to see again was Steve Fernandez '78, again I didn't recognize him either! But seeing him in the yearbook, it came back to me. He really changed as well, but still as beautiful! I met his lovely wife who is gonna pop that baby out soon!!! Don't forget to tell us when it arrives!!!! I remember Steve wearing dark glasses all the time. That's my memory of him and his long dark hair. But then in those days, it seems like we all had alot more hair! Steve - it was great to see you again. Oh and the one I was really surprised to see and meet again was Terryl Jones`'80. She was still as beautiful as she was in highschool and she still had that long hair! We looked at yearbooks together and that was nice. I am so glad you showed up girl, that was a real nice surprise! I was introduced to Dale Fullwood '77 but he had to leave early, but maybe at another reunion we'll be able to chat. I am sure we knew some of the same folks. I also introduced myself to a beautiful Pat Wiggins '69. If I remember correctly, she said her mom is filipina. So that was something else we had in common besides our Wagner days. I hope we can talk longer the next time Pat!! Now speaking of TALK! I had so much fun talking, that by the end of the night I LOST MY VOICE!!!! John P., Dary M., Harold F. and I were the last ones to leave Silky's. I just didn't want it to end. I had to look at Harold's yearbooks one more time. Everytime I wanted to say something, it wasn't coming out, plus like someone said in an earlier post, the music was LOUD. Now I can not tell you all how much I enjoyed myself. I think you all know. This has been a great year for Roggy so far. I have met alot of beautiful people!!!! 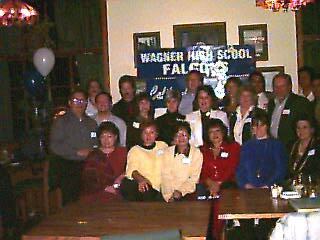 All from WAGNER!!!! Yeah! I hope to meet more Falcons this year! Dear John and Wendy! Thanks Thanks Thanks and Thanks ever so much! You did a great job! Let's do this again! In the pictures that you posted John P. the ones where I wasn't there. I was at my camera setting the timer. I will get my pictures developed today and I will get them to you ASAP!! Oh and one more thing. I was able to listen to the Superbowl on the radio in my new car while on my way back to Phoenix. I did get home at 6pm in time to watch the last quarter. All I can say about that is .... way to go Denver! Huh Kylene! That 7 hour drive WAS WORTH IT! Ya'll take care now - till the next reunion!!!!!! Bev Char '66 and Dary Matera '73. Roggy, You are too sweet for words. I, too, can't wait to to exchange stories at the next reunion. Everyone I talked to was impressed with your beauty, energy, friendliness, and humor. Glad to hear you made it back okay. I'll Second that!! Great time was had by all last night. I really enjoyed getting caught up with Janice, Rick, John and Bev! Only wish the music was quieter so we could keep on talking! Even met the infamous Dary -- and, he behaved himself! <g> Thanks so much to Wendy and John for putting it all together!!! John, don't forget to get the refund for the sign! All you listers out there, when you see the pictures, check out the SoCal spelling! What a kick! Another picture of the '60s group. (Front left) Bev Char '66, Janice Char '64, Elvy Tagala '68, Pat Wiggins '69, Linda Grice '80, Sua Ann Banks '80. 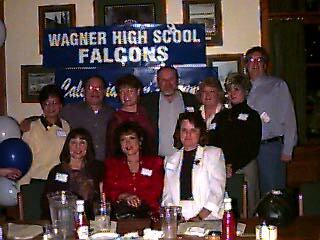 (Middle left) John Prunier '65, Harold Forster '78, Sandy Altvater '64, Sherry Weaver '64, Diann Crotwell '69, Linda Key '65, Rick Grice '64, Steve Fernandez '78. Missing: Dale Fullwood '77, Karen Rogg '80, ?? The west coast party people had to recover and get on to other parties, to witness the upset of the year, go Denver. That must be why there are so few posts yet. And now I am tired and ready to hit the sack to get enough sleep, for tomorrow's a work day. The reunion was terrific. How does anyone explain the feelings and excitement of being with old friends and making new friends that share similiar experiences. There was so much memoribilia to look at and so much to talk about. I didn't get a chance to see the '78 yearbook until after 11 pm. I want to see Harold's 78 yearbook again. Dale Fullwood '77 was great; he brought a couple old uniforms. Only, he left us early because he had superbowl tickets and parties in San Diego to get to. We were so wrapped up in discussions that we had to just start handing out menus to get people to sit down and order dinner. 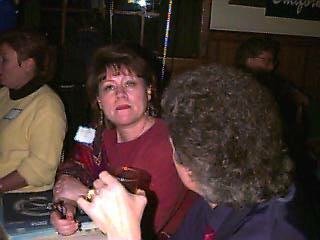 Sue Ann, it was so great to see you. We were stable buddies, our horse's stalls were next to each other. Last we saw each other was 1976. Sue Ann had Tammy and I had Rusty. We compared photos of the stables during bicentennial when the riding ring was painted red, white and blue. It seems to be a big blur right now. The night went by so fast. John is working on posting the pictures. We met the infamous Dary Matera. In person, one would never think he could get himself kicked off the mailing list. It was great to have Karen Rogg and Dary travel out from Arizona. I hope someone with more eloquency can write more about the reunion. Steve Fernandez '78 was there with his wife. They will have a new baby in about one week. Congratulations go out to them. 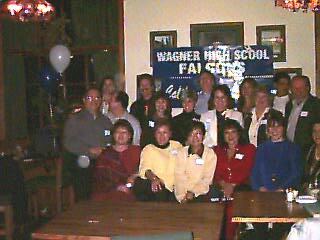 Harold Forster '78 did a great job rounding up alumni to come to the reunion. Harold Forster '78, Terryl Jones '80, and Karen Rogg '80.